James Allen (Minister of Defence) and Brigadier Alfred Robin (head of the army in New Zealand) planned the buildup of the New Zealand Army. The Main Body of the N.Z. Expeditionary Force departed in October 1914 – 8,500 soldiers and 3800 horses. Additional men, known as Reinforcements, had to be trained and sent overseas at regular intervals, to increase the Main Body and replace casualties. 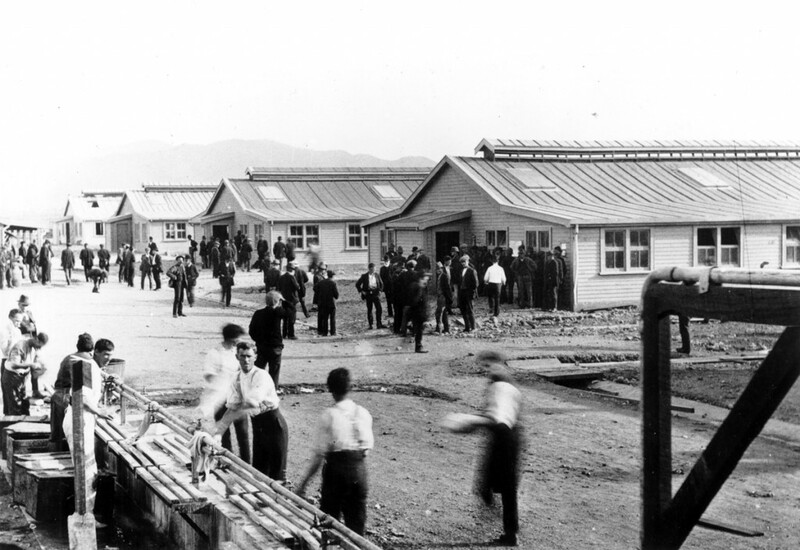 Trentham Camp, in the Hutt Valley, was the first permanent training camp. The site was not ideal and health problems increased, with soldiers suffering from influenza, measles and meningitis. By July 1915, 33 soldiers had died and on 9 July most of the 7,000 trainees were evacuated to temporary camps while Trentham was redesigned with proper drainage, sewage, roading and more barracks. Mounted riflemen in training rode up to the Wairarapa, camping briefly at Tauherenikau Racecourse before setting up a tent camp 2 km to the north. Army officers looked at various Wairarapa sites before selecting Featherston Camp’s land. The land was stony but well-drained, and close to road, rail and water. 100 acres north of the main road became the barrack camp, while 50 acres south of the road became the service area, with hospitals, shops and canteens, religious institutes and clubs for soldiers and officers. Additional land nearby was leased for Canvas Camp and several training grounds. The first plan was to house 2,500 men in 50 hutments (barracks) but that quickly increased to 4,500 in 90 hutments. Beginning in August 1915, the Public Works Department built the camp. By December, over 1000 men were working on the site. The 3.5km railway spur from Featherston allowed easy delivery of building material. Over three million feet of timber and 30 tons of nails were used, along with 11km of steel water pipes. The camp was lit by electricity generated at a coal-burning power house. Access roads, paths, showers and surface drainage were all planned for this ‘model’ camp. Stables for 500 horses were built to serve mounted rifles, artillery and Army Service Corps. The camp had an independent water system, first from wells and later from water races. Incinerators were provided for disposal of rubbish and human waste. Development at Featherston Camp continued until the war ended. A bakery was added so bread could be made on-site. The hospital grew and dental facilities were also added. Lieutenant-Colonel Noel Adams was camp commandant from opening until the influenza epidemic in November 1918, when he fell sick. Canvas Camp, south of the main road, had only basic facilities for the men in tents, as the time there was designed to toughen the soldiers.